I first went to India in 2005 filming a story on tea for TVNZ and fell in love with the colour, noise, laughter, food and extraordinary textiles and block-printed fabric of that sun-drenched country. I've been hosting culinary tours in India since 2009 and because of the quality and heart-stopping beauty of the handcrafts, they have sort of turned into food and shopping tours. Rajasthan is particularly expert in block-printing and my scarves are sustainably hand made in Bagru, a village about an hour outside Jaipur. 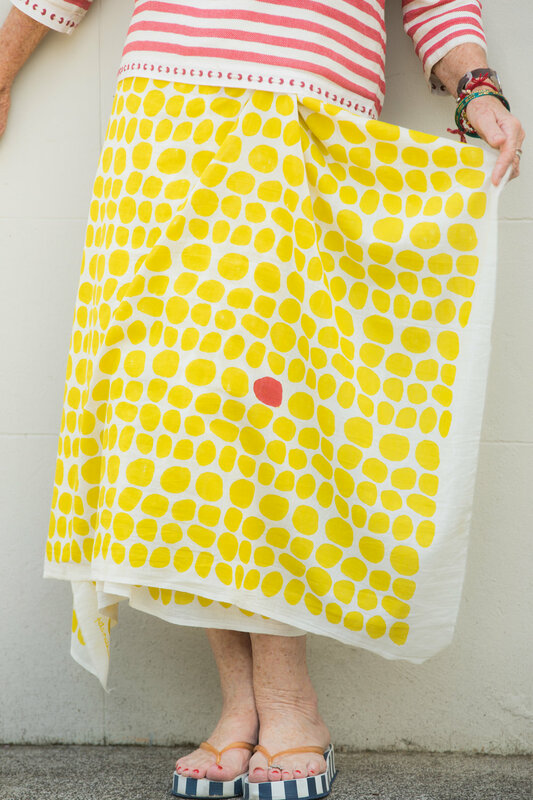 Blocks are carved with the design created by Bella Akroyd of phd3 in Auckland, then dipped in non-toxic dyes by a master printer and marked on the fabric. When you wear these floaty, versatile scarves you feel you can be as graceful as Indian women with their incredibly good taste. They are un-hemmed to show they are handmade and not factory produced. The colours are inspired by the startlingly riotous and colourful clothes of Rajasthani women. 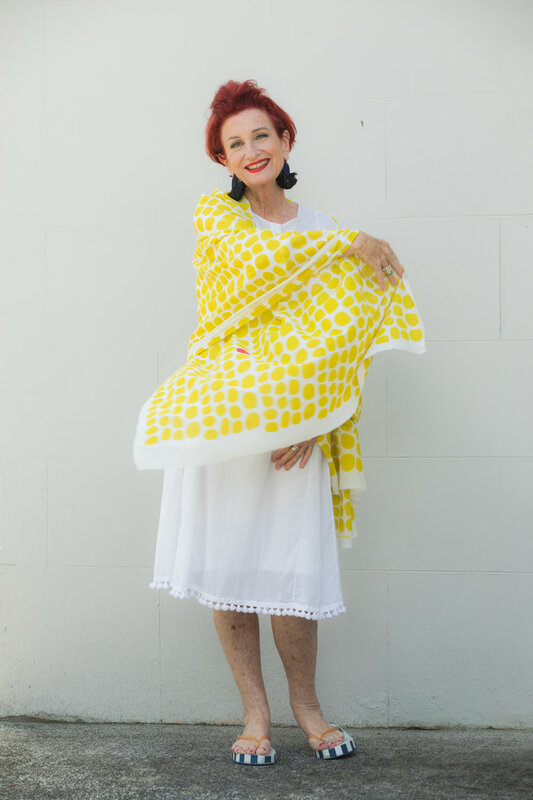 They can be worn as a shawl, scarf, wrapped around the body or tied in a turban. 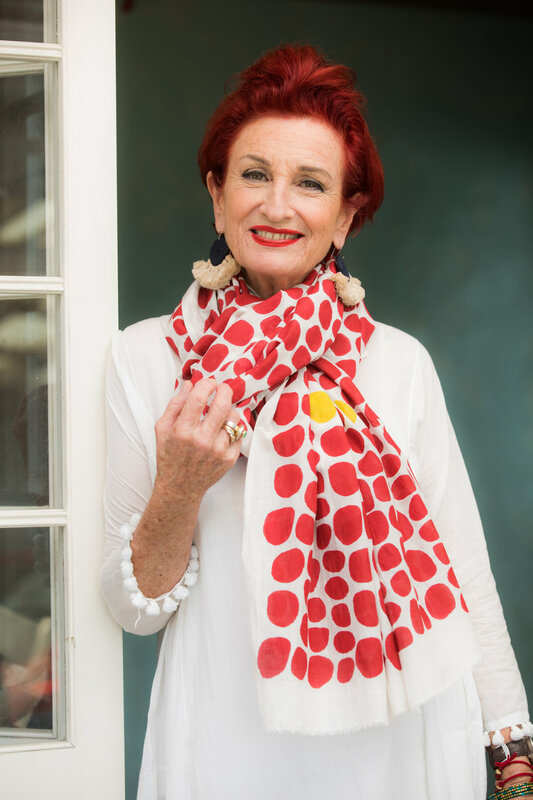 My scarves are a silk and Indian cotton blend and are available in two colours – Pomegranate (red) and Chartreuse (yellow) with dimensions of 220 x 88cm. Scarves are NZ$75 (includes postage within NZ and Australia). To purchase please contact us directly. Payment via PayPal available.